Since 2005, we’ve run a very busy repair shop for pro audio equipment and vintage gear in general. 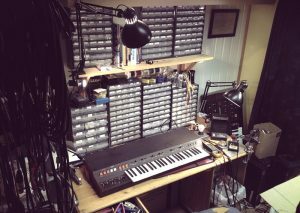 We prefer fixing old, cranky analogue gear – Tube amps, synthesizers*, consoles, outboard, microphones, effect pedals and tape machines are all welcome. We do not do home entertainment systems, solid state amps, acoustic instruments, non-music equipment, or anything by Behringer**. If you’re in a hurry, note that with the the small size of our operation, some repairs might take a while, especially if parts have to be imported. Effect pedals, guitar amps and outboard generally have a quicker turn-around than vintage synths and restoration work. If you’re just looking for some advice or odd part, we will try to help as much as time allows. The repair shop is located in Gøteborggata 23 at Grünerløkka, Oslo. Opening hours: 10 – 16:00, Monday to Friday. Call prior to visiting to make an appointment, as we might be out for on-location services. Also, we only do ARP Soloists if your name is David, ARP Omnis only if your name is Kim, and anything Simmons only if your name is Dan. ** Or of similar build quality or business philosophy.